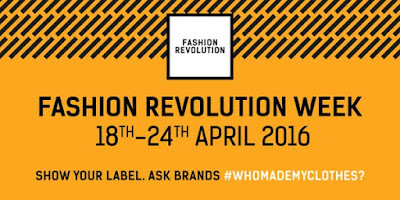 Today kicks off Fashion Revolution Week - a campaign created to commemorate the fatal Rana Plaza disaster that occurred 24 April 2013. It took the lives of over 1,100 clothing factory workers in Dhaka, Bangladesh, and injured more than 2,500. Many of the injured still await compensation for their horrific injuries. In my work as a researcher and writer, I get to meet many fashion innovators who are changing the way supply chains and fabrics are created, and I know we are on our way to true Fashion Revolution. But there is still a huge need to encourage existing brands to hasten their transition toward traceable supply chains, fair work conditions for all labourers, and cleaner environmental practices. This is where you come in . . . 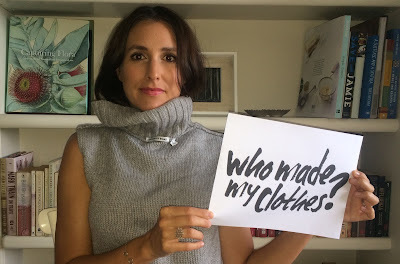 The fine folks at Fashion Revolution are asking us to have the loudest and most visible conversation about where our clothes come from, the conditions under which they are made and the impact they have on our planet. So this week, take a photo of yourself wearing your clothes inside out (and maybe backwards! ), and post it to social media tagging the brand you are wearing and using the hashtag #whomademyclothes. Here's my #insideout photo for the day - my beloved cowl neck sleeveless cable knit jumper. It's the perfect thing to wear in these 'in between seasons' and I bought it from Country Road because I've heard through the grapevine that they are committed to transitioning to an ethical supply chain, but I want to know more. and fashion icons Akira Isogawa, Stella McCartney, and Kit Willow. What will you turn inside out this week? Tag me on Instagram and I'll make sure to re-post - let's make this the biggest Revolution the fashion industry has seen! Here are some of my outtakes - a million thanks to my hubby and photog extraordinaire for helping me get the perfect pic - oh the life of a blogger!